The first thing any thinking person learns about the Internet is not to trust everything you see there. While you can find much well-researched and reliable material, you’ll also encounter disinformation, spoofs, doctored photographs and crazy conspiracy theories. That would seem to be a basic rule of the Web – caveat emptor and be careful what you do with the information – unless you’re following a preferred neocon narrative. Then, nothing to worry about. A devil-may-care approach to Internet-sourced material has been particularly striking when it comes to the case of the shoot-down of Malaysia Airlines Flight 17 over eastern Ukraine on July 17, 2014. It has now become de rigueur on the part of the West’s mainstream news outlets to tout the dubious work of a British Internet outlet called Bellingcat, which bases its research on photographs and other stuff pulled off the Internet. Bellingcat’s founder Eliot Higgins also has made journalistic errors that would have ended the careers of many true professionals, yet he continues to be cited and hailed by the likes of The New York Times and The Washington Post, which have historically turned up their noses about Internet-based journalism. But there’s always room for new recruits. Blogger Higgins made his first splash by purporting to prove the accuracy of U.S. government claims about the Syrian government firing rockets carrying sarin gas that killed hundreds of civilians on Aug. 21, 2013, outside Damascus, an incident that came close to precipitating a major U.S. bombing campaign against the Syrian military. Those of us who noted the startling lack of evidence in the Syria-sarin case – much as we had questioned the Iraq-WMD claims in 2002-03 – were brushed aside by Big Media which rushed to embrace Higgins who claimed to have proved the U.S. government’s charges. Even The New York Times clambered onboard the Higgins bandwagon. Higgins and others mocked legendary investigative journalist Seymour Hersh when he cited intelligence sources indicating that the attack appeared to be a provocation staged by Sunni extremists to draw the U.S. military into the war, not an attack by the Syrian military. Despite Hersh’s long record for breaking major stories – including the My Lai massacre from the Vietnam War, the “Family Jewels” secrets of the CIA in the 1970s, and the Abu Ghraib torture during the Iraq War – The New Yorker and The Washington Post refused to run his articles, forcing Hersh to publish in the London Review of Books. Hersh was then treated like the crazy uncle in the attic, while Higgins – an unemployed British bureaucrat operating from his home in Leicester, England – was the new golden boy. While Higgins was applauded, Hersh was shunned. But Hersh’s work was buttressed by the findings of top aeronautical scientists who studied the one rocket that carried sarin into the Damascus suburb of Ghouta and concluded that it could have traveled only about two kilometers, far less distance than was assumed by Official Washington’s “group think,” which had traced the firing position to about nine kilometers away at a Syrian military base near the presidential palace of Bashar al-Assad. “It’s clear and unambiguous this munition could not have come from Syrian government-controlled areas as the White House claimed,” Theodore Postol, a professor in the Science, Technology, and Global Security Working Group at Massachusetts Institute of Technology, told MintPress News. Postol published “Possible Implications of Faulty US Technical Intelligence in the Damascus Nerve Agent Attack of August 21st, 2013” in January 2014 along with Richard Lloyd, an analyst at the military contractor Tesla Laboratories who was a United Nations weapons inspector and has to his credit two books, 40 patents and more than 75 academic papers on weapons technology. In the wake of the Postol-Lloyd report, The New York Times ran what amounted to a grudging retraction of its earlier claims. Yet, to this day, the Obama administration has failed to withdraw its rush-to-judgment charges against the Syrian government or present any verifiable evidence to support them. So, Higgins and Bellingcat moved on to the mystery surrounding MH-17, where again the Obama administration rushed to a judgment, pinning the blame on the Russians and ethnic Russian rebels in eastern Ukraine who were fighting the U.S.-backed regime in Kiev. Though again hard evidence was lacking – at least publicly – Official Washington and its many minions around the world formed a new “group think” – Russia’s President Vladimir Putin was responsible for the 298 deaths. This official told the Post that there wasn’t just one Buk battery, but three. The supposed existence of these Buk systems in the rebels’ hands was central to the case blaming Putin, who indeed would have been highly irresponsible if he had delivered such powerful weapons – capable of hitting a commercial airliner flying at 33,000 feet as MH-17 was – to a ragtag rebel force of ethnic Russians in eastern Ukraine. But there were problems with this version, including the fact that – as reflected in a “government assessment” from the Director of National Intelligence released on July 22, 2014, (or five days after the crash) – U.S. intelligence listed other weapons allegedly provided by the Russians to the ethnic Russian rebels but not a Buk anti-aircraft missile system. In other words, two days after the Post cited a U.S. official claiming that the Russians had given the rebels the Buks, the DNI’s “government assessment” made no reference to a delivery of one, let alone three powerful Buk batteries. And that absence of evidence came in the context of the DNI larding the report with every possible innuendo to implicate the Russians, including references to “social media” entries. But there was no mention of a Buk delivery. The significance of this missing link is hard to overstate. At the time eastern Ukraine was the focus of extraordinary U.S. intelligence collection because of the potential for the crisis to spin out of control and start World War III. Plus, a Buk missile battery is large and difficult to conceal. The missiles themselves are 16-feet-long and are usually pulled around by truck. U.S. spy satellites, which supposedly can let you read a license plate in Moscow, surely would have picked up these images. And, if – for some inexplicable reason – a Buk battery was missed before July 17, 2014, it would surely have been spotted on an after-action review of the satellite imagery. But the U.S. government has released nothing of the kind – not three, not two, not one. Instead, in the days after the MH-17 crash, I was told by a source that U.S. intelligence had spotted Buk systems in the area but they appeared to be under Ukrainian government control. The source who had been briefed by U.S. intelligence analysts said the likely missile battery that launched the fateful missile was manned by troops dressed in what looked like Ukrainian uniforms. Subsequently, the source said, these analysts reviewed other intelligence data, including recorded phone intercepts, and concluded that the shoot-down was carried out by a rogue element of the Ukrainian government, working with a rabidly anti-Russian oligarch, but that senior Ukrainian leaders, such as President Petro Poroshenko and Prime Minister Arseniy Yatsenyuk, were not implicated. However, I have not been able to determine if this assessment was a dissident opinion or a consensus within U.S. intelligence circles. Another intelligence source told me that CIA analysts did brief Dutch authorities during the preparation of the Dutch Safety Board’s report but that the U.S. information remained classified and unavailable for public release. In the Dutch report, there is no reference to U.S.-supplied information although the report reflects sensitive details about Russian-made weapons systems, secrets declassified by Moscow for the investigation. Into this propaganda-laced controversy stepped Eliot Higgins and Bellingcat with their “citizen journalism” and Internet-based investigation. The core of their project was to scour the Internet for images purportedly of a Buk missile system rumbling through the eastern Ukrainian countryside in the days before the MH-17 crash. After finding several such images, Bellingcat insistently linked the Buk missiles to the Russians and the rebels. Supposedly, this investigative approach is better than what we traditional journalists do in such cases, which is to find sources with vetted intelligence information and get them to share it with us, while also testing it out against verifiable facts and the views of outside experts. Our approach is far from perfect – and often requires some gutsy whistle-blowing by honest officials – but it is how many important secrets have been revealed. A central flaw in the Internet-based approach is that it is very easy for a skilled propagandist in a government dirty-tricks office or just some clever jerk with Photoshop software to manufacture realistic-looking images or documents and palm them off either directly to gullible people or through propaganda fronts that appear as non-governmental entities but are really bought-and-paid-for conduits of disinformation. This idea of filtering propaganda through supposedly disinterested – and thus more credible – outlets has been part of the intelligence community’s playbook for many years. I was once told by Gen. Edward Lansdale, one of the pioneers of CIA psychological operations, that his preference always was to plant propaganda in news agencies that were perceived as objective, that way people were more believing. After the Pentagon Papers and Watergate scandals of the 1970s, when the American people were suspicious of whatever they heard from the U.S. government, the Reagan administration in the 1980s organized inter-agency task forces to apply CIA-style techniques to manage the perceptions of the U.S. public about foreign events. The architect was the CIA’s top propaganda specialist, Walter Raymond Jr., who was transferred to the National Security Council staff to skirt legal prohibitions against the CIA manipulating Americans. The same process continues to this day with some of the same trusted outlets, such as Freedom House and Atlantic Council, but requiring some new fronts that have yet to be identified as propaganda conduits. Many receive discreet or backdoor funding from the U.S. government through the National Endowment for Democracy or other U.S. entities. For instance, the U.S. Agency for International Development (along with billionaire George Soros’s Open Society Institute) funds the Organized Crime and Corruption Reporting Project, which targets governments that have fallen into U.S. disfavor and which are then undermined by reporting that hypes alleged ties to organized crime and corruption. The USAID/Soros-funded OCCRP alsocollaborates with Bellingcat. Yet, because Higgins’s claims dovetail so neatly with U.S. government propaganda and neoconservative narratives, he is treated like an oracle by credulous journalists, the Oracle of Leicester. For instance, Australia’s “60 Minutes” dispatched a crew to Higgins’s house to get the supposed coordinates for where the so-called “Buk getaway video” was filmed – another curious scene that appeared mysteriously on the Internet. When “60 Minutes” got to the spot near Luhansk in eastern Ukraine where Higgins sent them, the location did not match up with the video. Although there were some billboards in the video and at the site in Luhansk, they were different shapes and all the other landmarks were off, too. Still, the Australian news crew pretended that it was at the right place, using some video sleight-of-hand to snooker the viewers. However, when I published screen grabs of the getaway video and the Luhansk location, it was clear to anyone that the scenes didn’t match up. Yet, instead of simply admitting that they were in error, the “60 Minutes” host did a follow-up insulting me, asserting that he had gone to the place identified by Higgins and claiming that there was a utility pole in the video that looked something like a utility pole in Luhansk. A screen shot from the so-called “getaway” video supposedly taken shortly after MH-17 was shot down showing the road that the suspected BUK anti-aircraft missile battery was taking. A screen shot from Australia’s “60 Minutes” update supposedly showing a utility pole in the “getaway” video and matching it up with a poll in an intersection of Luhansk in eastern Ukraine. However, note that the inset obscures the spot where a house appeared on the original video. But Higgins’s aura was such that objective reality and logic no longer seemed to matter. That two utility poles looked somewhat alike when nothing else in a video matched up at all somehow proved you were at the right location simply because the Oracle of Leicester had sent you there. I’ve known many excellent journalists who saw their careers ended because they were accused of minor slip-ups on difficult stories when they were clearly correct on the big picture. Think, for instance, of the harsh treatment meted out to Gary Webb on Nicaraguan Contra drug trafficking and Mary Mapes on George W. Bush’s shirking his National Guard duty. But different rules clearly apply if you make serious errors in line with U.S. propaganda. For example, think of virtually the entire mainstream news media buying into the false Iraq-WMD claims and facing almost no accountability at all. The second set of rules apparently applies to Higgins and Bellingcat, who have the mainstream U.S. media on bended knee despite a record of journalistic misfeasance or malfeasance. In editorials about the Dutch Safety Board report last week , both The New York Times and The Washington Post hailed Bellingcat – as if they were recognizing that the old mainstream media had to rub shoulders with supposedly “new media” to have any credibility. It was a moment that would have made the CIA’s Lansdale and Raymond smile. The Post’s neocon editorial writers, who have backed “regime change” in Iraq, Syria and other targeted countries, viewed the Dutch Safety Board report as vindicating the initial rush to judgment blaming the Russians and praised the work of Bellingcat – although the Dutch report pointedly did not say who was responsible or even where the fatal missile was launched. 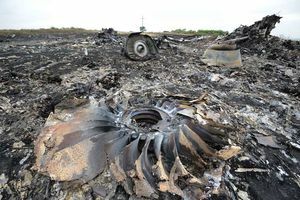 “More forensic investigation will be necessary to identify precisely where the missile came from, but the safety board identified a 123-square-mile area mostly held by the separatists,” the Post wrote, although a different way of saying the same thing would be to note that the launch area identified by the report could suggest the firing by either Ukrainian forces or the rebels. The Post did observe what has been one of my repeated complaints — that the Obama administration is withholding the U.S. intelligence evidence that Secretary of State John Kerry claimed three days after the shoot-down had identified the precise location of the launch. Yet, the subsequent U.S. silence on that point has been the dog not barking. Why would the U.S. government, which has been trying to pin the shoot-down on the Russians, hide such crucial evidence – unless perhaps it doesn’t corroborate the desired anti-Putin propaganda theme? So, the Post sees nothing suspicious about the U.S. government’s sudden reticence after its initial loud rush-to-judgment. Note also the Post’s lack of skepticism about what these “technical means” had scooped up. Though the U.S. government has refused to release this evidence – in effect, giving those responsible for the shoot-down a 15-month head start to get away and cover their tracks – the Post simply takes the official word that the Russians are responsible. Again, the Post shows little skepticism about this version of events, leaving only the question of whether Russian soldiers fired the missile themselves or helped the rebels fire it. But there are obvious problems with this narrative. If, indeed, the one, two or three Russian Buk batteries were rumbling around eastern Ukraine the month before the shoot-down, why did neither U.S. intelligence nor Ukrainian intelligence notice this? And, we know from the Dutch report that the Ukrainians were insisting up until the shoot-down that the rebels had no surface-to-air missiles that could threaten commercial airliners at 33,000 feet. However, the Ukrainians did have Buk systems that they were positioning toward the east, presumably to defend against possible Russian air incursions. On July 16, 2014, one day before MH-17 was hit, a Ukrainian Su-25 fighter-jet was shot down by what Ukrainian authorities said was an air-to-air missile, according to the Dutch report. Presumably the missile was fired by a Russian fighter patrolling the nearby border. So, if the Ukrainians already believed that Russian warplanes were attacking along the border, it would make sense that Ukrainian air defense units would be on a hair-trigger about shooting down Russian jets entering or leaving Ukrainian airspace. Even if you don’t want to believe what I was told about U.S. intelligence analysts suspecting that a rogue Ukrainian military operation targeted MH-17, doesn’t it make sense that an undisciplined Ukrainian anti-aircraft battery might have mistakenly identified MH-17 as a Russian military aircraft leaving Ukrainian airspace? The Ukrainians had the means and the opportunity and possibly a motive – after the shoot-down of the SU-25 just one day earlier. The Dutch Safety Board report is silent, too, on the question raised by Russian officials as to why the Ukrainians had turned on their radar used to guide Buk missiles in the days before MH-17 was shot down. That allegation is neither confirmed nor denied. However, a European source told me that the BND’s information was not as categorical as Der Spiegel reported. And, according to the Dutch report, the Ukrainian government reported that a Buk system that the rebels captured from a Ukrainian air base was not operational, a point where the rebels are in agreement. They also say they had no working Buks. Yet, even without the BND’s warning, great caution should be shown when using evidence deposited often anonymously on the Internet. The idea of “crowd-sourcing” these investigations also raises the possibility that a skillful disinformationist could phony up a photograph and then direct an unwitting or collaborating reporter to the image. Though I am no expert in the art of doctoring photographs, my journalism training has taught me to approach every possible flaw in the evidence skeptically. That’s especially true when some anonymous blogger directs you to an image or article whose bona fides cannot be established. One of the strengths of old-fashioned journalism was that you could generally count on the professional integrity of the news agencies distributing photographs. Even then, however, there have been infamous cases of misrepresentations and hoaxes. Those possibilities multiply when images of dubious provenance pop up on the Internet. In the case of MH-17, some photo analysts have raised specific questions about the authenticity of images used by Bellingcat and others among the “Russia-did-it” true-believers. We have already seen in the case of the “Buk-getaway video” how Higgins sent a reporting team from Australia’s “60 Minutes” halfway around the world to end up at the wrong spot (but then to use video fakery to deceive the viewers). So, the chances of getting duped must be taken into account when dealing with unverifiable sources of information, a risk that rises exponentially when there’s also the possibility of clever intelligence operatives salting the Internet with disinformation. For the likes of psy-ops innovator Lansdale and propaganda specialist Raymond, the Internet would have been a devil’s playground.